Oh, so close. That made sense for a while, and then….crash and burn! Although, I’d like to say, you are very welcome for my sweat! I was out the door and running by 6:45 AM. It was tough! I don’t like to get up before 6 AM on the weekend, but I also like to take my time getting ready. It was only with Jeff’s help (he filled my camelbak), that I managed to get out the door only a couple minutes later than my target time. I’ve been having a smoothie for breakfast on long run days, and it’s working quite well. I don’t like to eat immediately when I wake up, but I’m usually thirsty; the smoothie works well dealing with both of those issues. Also, it’s really easy. I’ll just have to figure out a way to do this on race day when I’m spending the night before in a hotel. Put it all in the blender and blend. The ice tends to make it a little icy. If you don’t like that, try a smidge more smilk instead. 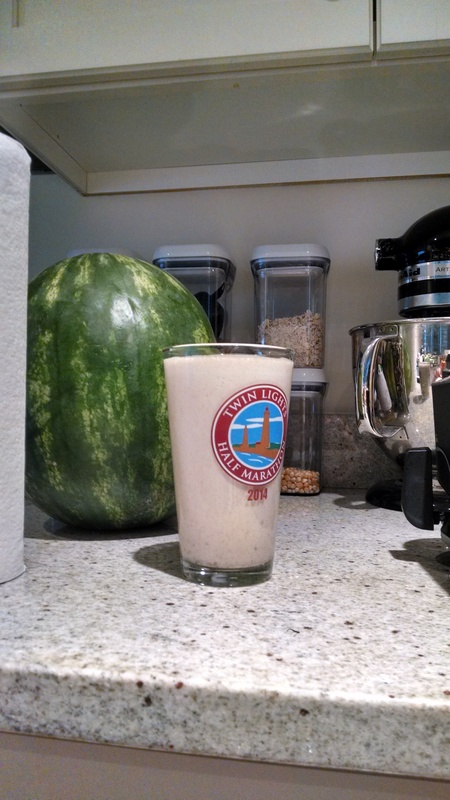 Pre-run smoothies go best when served in a pint glass from your last half marathon. Even though I say my run was uneventful, I did try out a few new things. First, I ate and drank more than usual. I brought enough gel to have one every 45 minutes, and I forced myself to actually follow that plan. For water, I made myself take one extra sip every time I had some. This fueling plan had two consequences. One was that I felt better at the end of the run than I normally do. Those last few miles weren’t easy, but I felt less like I was running on fumes. So that’s good. The other consequence was that I ran out of water at around mile 17. At that point, I went into a convenience store and bought the most refreshing gatorade I’ve ever drank in my whole life. I only had a credit card with me, and there was an $8 minimum, but after I offered to have the attendant charge me for 4 gatorades, he just let me pay with the card anyways. I was very grateful, but honestly if I had had to pay eight bucks, it would have been worth every penny. Over the last 3 miles, I carried the bottle and drank the entire thing. I really think it gave me a little extra burst of energy (remember the gummy bear show on the disney channel where they would drink gummiberry juice and get a burst of power…that’s how I felt) Now, I’m planning on getting another one next week, and trying to figure out how to get some on race day. The other new thing I tried was taking less walk breaks. I usually walk the first 0.1 of every mile, but this week I walked only while I was eating gu (and later, drinking gatorade). I was nervous that this would lead to some pretty tired legs, but like I mentioned before, I felt strong at the end of the run. So, I’m happy with how that went, and plan to stick to that plan for the rest of my long runs and the race. I ended up w/ a faster average pace than normal (even including the gatorade stop where I did not pause my watch – once I start it, I never pause it during a run), and I didn’t notice any adverse effects. Another win! Overall, I’d say it was a pretty productive run. How much do you eat/drink when you exercise? Do you remember Gummiberry juice? Do you pause your watch at all on long runs? And, as always…thank you for your sweat, guys and gals! I usually would have a Luna or Lara bar before a long run along with some coffee. Maybe a banana. Then during the long runs, I would have a Gu every 40-45 minutes. When I started running with a fuel belt, I had one bottle of plain water and the other I put Gatorade. Sometimes during the last half of my runs that Gatorade was so refreshing! I used to eat the same thing before a long run (a banana or lara bar), but then I tried a smoothie one day and loved it. I still go back to the bar/banana when I don’t feel like dragging the blender out it’s hiding place, though. 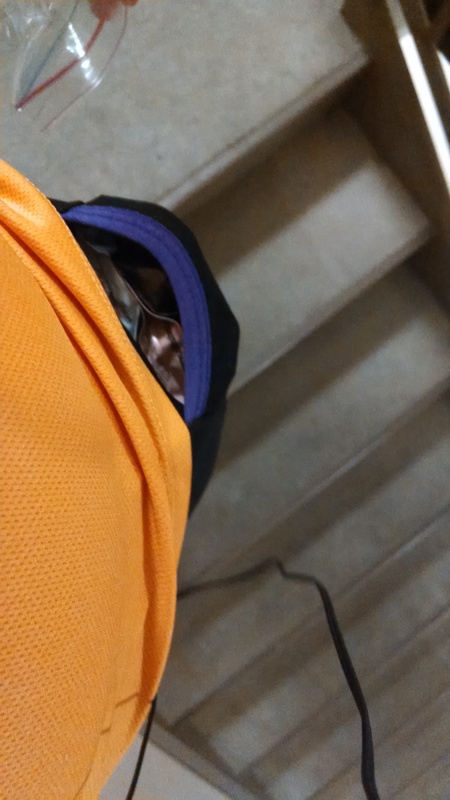 The Gatorade was amazing, and now is the only time I’m second guessing my camelbak because there isn’t really a way to carry both water and Gatorade. I’m still figuring out my fueling strategy for long runs. Right now I eat a Gu every 4ish miles, and just drink water as I want it, which is about every half mile or so. I think I may need to eat more though, as I am usually exhausted at the end of any run longer than 6 miles. I need to experiment with different breakfasts too. Haha, sorry….I don’t really remember the Gummibears theme song or show, just the Gummiberry juice. I also tend to drink water whenever I want it, but someone mentioned I might be dehydrated in my runs, so I figured I’d try to drink more, and it seemed to work. I don’t feel thirsty very often so making myself drink is probably a better plan for me. If I am on a long run, I take 1-2 GU’s with me and then always have something for after I finish my run (watermelon, protein bar, water or soy chocolate milk). Short runs (under 10k) I don’t eat anything or drink anything. I usually don’t bring anything to eat or drink until about the same distance as you…sometimes longer if it’s cold outside. I definitely eat as soon as I get in the house,too. I’ve been having juice and watermelon in the summer, hot chocolate in the winter is amazing, and once I even shoveled multiple cupcakes in my mouth as they were sitting on the counter and I was starving..haha! They were delicious, but I didn’t make it a habit. I am TERRIBLE at fueling for long runs. The longest I have done so far is 16. I usually drop a water bottle at mile 9…no gus or anything…I have to work on that. So far my breakfast before consists of 2 scrambled eggs and coffee. It’s only weird if it doesn’t work!! I guess that’s true. If it works, don’t question it! I think the hardest part for me with fueling is that I don’t want to eat the gu until I feel hungry, but if I wait until then, I’ve waited too long. That Gatorade was amazing. Once I realized I was going to run out of water and that I should/could buy Gatorade at mile 17, I basically chanted “GAT-OR-ADE” with every step I took for two miles. It’s interesting reading all the comments about fueling and seeing so many people say they haven’t gotten it figured out yet. I’ve been running for quite a while, and still don’t feel like I’ve got it figured out. At least not perfectly. Wow congrats! 20 miles is a lot! It sounds like you did an awesome job with it it. I also try not to pause my watch once I start it, unless I have to stop to go to the bathroom or something. It just messes with my mile pace!